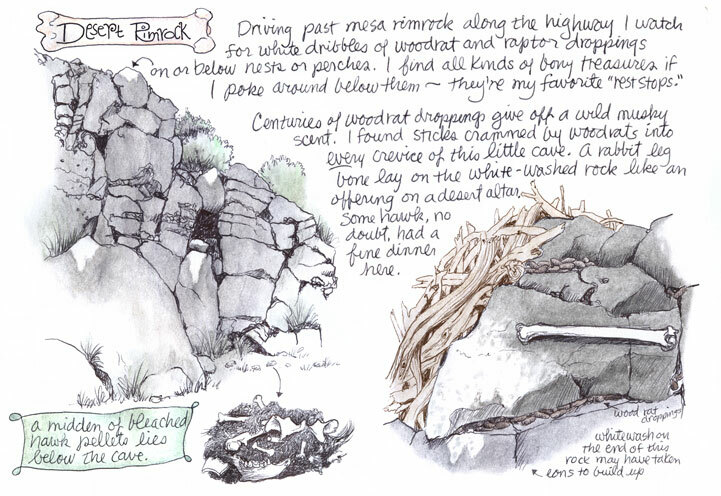 This sketch journal is the record of an April journey with sketchbook and ballpoint pen across the High Desert country of Central Oregon. It ends in the Owyhee Mountains of Southwestern Idaho, Irene's childhood stomping grounds (click on an image for a larger view). In response to many requests, Irene has put together a tutorial showing in text and photos how this journal was created, page by page. You can see more about that here. 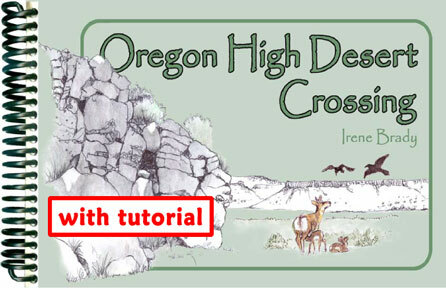 The journal and sketches cover four days of travel through lodgepole forests near Crater Lake National Park and the long vistas of juniper flats and sagebrush country of Central and Eastern Oregon, and describes encounters with a pronghorn antelope with fawns (they're also shown on the journal cover, above), a long-eared owl family, and an exciting encounter with a baby rattlesnake. 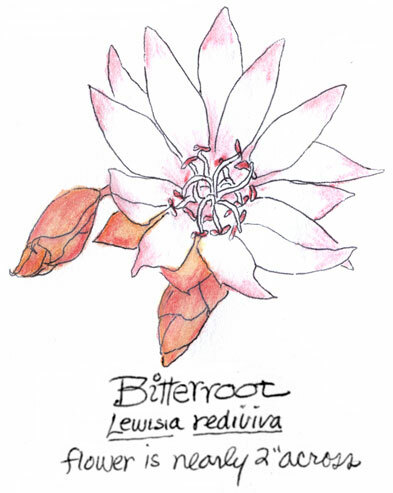 Along the way, you can enjoy gorgeous desert wildflowers, including the Bitterroot, a staple Native American food; Indian Paintbrush, with its vivid red or orange-tipped bracts splashing bright color across the gray-green sagebrush-covered hills; and many other discoveries. 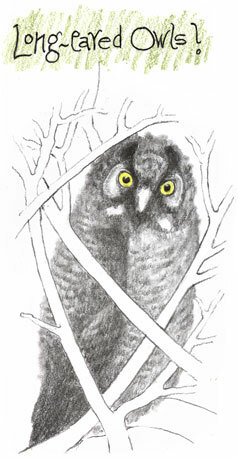 The sketches, in ballpoint pen, many of them colored with watercolor pencils (and one graphite pencil drawing, the long-eared owlet) are surrounded by observations and written details that transport you headlong into the journey with Irene. This is wild country, not far removed from the days when pioneers crossed in covered wagons, cowboys and sheepherders escorted their herds and flocks across the hills, and Native Americans visited the Glass Buttes area to collect shiny ebony chunks of obsidian from which they flaked points and spearheads for hunting deer, jackrabbits and pronghorns (there's a small chip glued right onto the corner of one journal page). 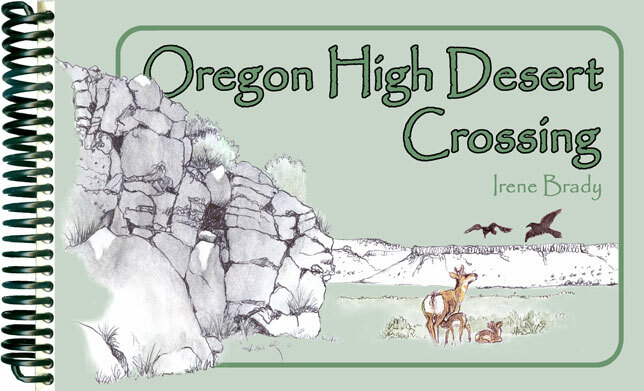 It is easy to imagine these ancient peoples appearing on the horizon as you drive through or stop to explore a rimrock now inhabited by hawks, owls, and woodrats. Below is what an actual page from the journal looks like. It is priced at $6.95.